I bought a Raspad from Sunfounder and i want to use it with a much powerful sbc as Nanopi M4 4gb. 1) the plastic case need to be modified since the heatsink doesn't fit inside. 2)I suppose that the screen will work with no problems but what about the touchscreen? I need to verify the touchscreen model looking for drivers available for an OS compatible with the Nanopi M4. Is it correct? 3)the raspberry inside the raspad should be powered through an USB type-c but I know that Rpi and Nanopi M4 have different power demands so what can i do? I have to entirely replace the battery or what else? Hi. I just checked a video about that Raspad. What you need to know is how much amps that power supply can handle. Best would be 2.5A. Then just use a microUSB to USB-C adapter. It isn't quickcharge. The display works with hdmi, so that should be no problem. The biggest problem will be making it fit. You'll have to have the heatsink in that case, and the m4 sticking out on the backside. That way there will be no airflow over the heatsink. So it will overheat quickly. If you have drivers for the touchscreen, then it should work. Maybe better to make another case for it so you don't need to destroy that. Buy some plexiglass, cut it and paste it. when I will receive all the stuff i will post the result. Can I use them with the Nanopi M4 without any risk? I read that this SBC does not work with usb-c PD compliant technology but these two items seems to have a supercharge ability while no references about PD compliant in the specifications of the products can be found. Are these two items PD compliant or not? I don't think this is a problem. Most quick charge adapters are backwards compatible. I did use a longer usb-c cable that should be good for 3A. Because of this cable there was a extreme under voltage when used to the max. With armbian which uses the cpu at 1.5Ghz/2Ghz and uses 2A maxed out (compared to 1.5A with FriendlyDesktop) the voltage on my USB ports went under 4.5V. This is no good to power hard drives or anything else. So check the voltage on the usb, if it's not stable at 5V, then replace the cable. finally last weeks I received all the stuff. - the touchscreen works depending on the OS: doesn't work with Recalbox installed on microSD but works perfectly with Friendly Desktop (Ubuntu 18.04) on emmc module. - the Raspad battery is IMHO too small for powering both the screen (with speakers) and Nanopi M4, so I decided to buy a Rawpower powerbank 26800 mAh and works great. - the Sunfounder bluetooth keyboard does not work with Friendly Desktop or Recalbox. the nanopi doesn't see the device via bluetooth and I think the microusb to usb connection is intended to recharge only the battery of the keyboard and not to send data to the board. I need your help again regarding fan installation, because I want to add via gpio a PWM Noctua fan I bought, but I don't know how to do this. Do I need to install something after connecting the fan? Where did you find RecalBox for the M4? so I decided to buy a Rawpower powerbank 26800 mAh and works great. I also got 2 of them. Best powerbanks I ever bought. Always a stable voltage, and they can give a lot of juice. Have you tried it on another device? Does bluetooth work in RecalBox? I've got it for the Rock4B, there bluetooth doesn't work yet. Have you tried bluetooth in FriendlyDesktop with another device? I always use RII I8 Mini's(or clones, some clones are better) with dongle(wifi) for on the go systems. Otherwise normal keyboards with mouse with dongle at home. Too much hastle with bluetooth keyboards. It does look like a nice keyboard. it is for Rockpro64 but works great on M4. the same for PSX emulation. I did not try it with another device and I did not try another Bluetooth device with Recalbox or Friendly Desktop. I have to do these two trials thank you! Can you help me about the fan? That isn't as simple as pi. Is that Noctua fan 5V? What's the type? How many connections does it have? I think it will have pwm, but it must be 5V to power it with the M4. Considering that the fan is intended for connecting to the board via GPIO maybe I can use these libraries, or not? Yes. You can use wiringpi for that. 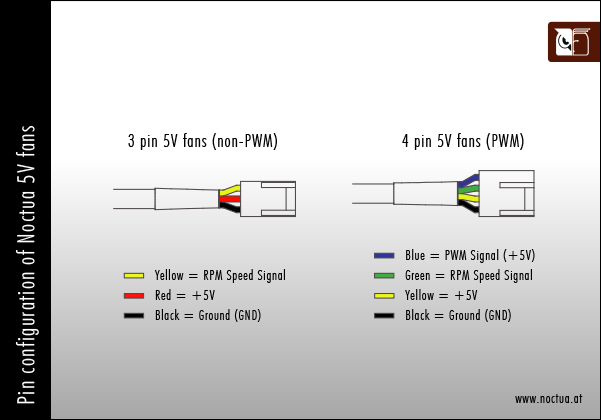 Your fan is a 4-pin. There`s a few things that could be a problem. Most of the M4 it`s GPIO`s are only 3V or 1.8V. Only the VDD is 5V. I don`t know if it will work with 2 different voltages. Try it to see. Here a good video that explains how to work with 4 pin fan. What I see as an easy solution (for me) would be to use a microcontroller with a thermsistor. Put the thermistor on the heatsink an read the value. Then give the pwm with the microcontroller. You can power the microcontroller with 5V from the sbc, power the fan with 5V, and the pwm with the microcontroller. Enough room on that fan to put it on there. Let me know how it goes, I haven`t done anything with the gpio`s of the M4. I confirm there are 4 cable exiting the fan. I am on the fence regarding the connection of a 5v fan to a 3.3v gpio. I am not an expert so reading online forums etc is the only thing I can do to better understand voltage etc. At this regard I apologize if I haven't fully understood the thing, but somewhere I read that this shouldn't be done since it can cause serious damages to the board. because in many youtube videos and websites I noticed fans connected via gpio to the raspberry gpio as well, even if max voltage which should pass through the Rpi gpio should be up to 3.3V. Yes and maybe it is true. I'm also no expert. But you could short your board if you do this wrong. it can't hurt the board to mix 5V with 3.3V to a common ground. But I don't think the fan will work properly. It depends on how the fan reads the pwm. You would need to make a circuit board, but I'm not sure of the components, and I can't find a good example. What's imo much easier to do is put a pot meter in between the fan and the 5V gpio. Then you don't need the pwm to control the speed, but you have to turn it higher yourself when it's needed. For this you MUST use a resistor or YOU WILL short/burn your board and potentiometer. There are 3 pins on a pot meter, one end is ground, the other is vcc. The middle pin is where you would need to connect your vcc from your fan. Then ground from the fan also goes to a normal ground. I've made a very pretty drawing of this. You could then paste the pot meter to the fan so they're a whole. But again, I'm also no expert. I'm a hobbyist who makes (a lot) mistakes himself.